Trails are the perfect place to unwind, relax, enjoy a picnic or take a romantic stroll. Here are the best routes to take a hike, or ride your bike in this area! Over 3000 acres Allaire State Park is best known for its 19th century historic village and its array of trails. Start along the Manasquan Reservoir and explore over 200 species of wildflowers, trees, plants, birds, and wildlife or head over to the “South Side,” where there is over a dozen trails, all ranging from beginner to advanced! The local favorite! No matter what time of day it is, you can always see people running, jogging or walking the Spring Lake Boardwalk. It’s a little over 3.5 miles and perfect to bring your kids to get a sweat on with you! The path around the reservoir is 1.6 miles in length and made up of crushed rock – making it super comfortable for walking or jogging. Pet and family friendly. If you are ever looking for a peaceful spot, this is one place to check out. The 54 acres of gardens and greenhouses feature 55 varieties of roses with more than 170 bushes. There is a natural pond with frogs at the very back, and a soothing Lily Pond. with Koi near the entrance. It’s the perfect getaway from the hustle and bustle of time. Enjoy a relaxing and quiet day in nature. There are tons of benches all around to sit, chat, read and observe all the beauty around you! With over 1200 acres of land, Manasquan Reservoir has offers two trails: a 1 mile walk through nature or a 5 mile perimeter trail. This beautiful spot also offers fishing, boating, kayaking and boat rentals. Shark River Park has something for everyone! Aside from trails, there are playgrounds, open fields, a fishing pond, picnic tables, and more. The trails in the park are open for biking, hiking, horseback, and snow sports. The trails around the parking/picnic area off Schoolhouse Rd are good, but short. If you cross over Schoolhouse Road, you will find about 7 miles of trails. The most scenic trail is called “Pine Hills” – definitely a must see! 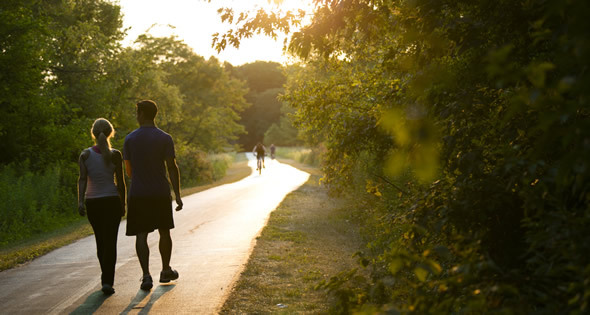 5.4 miles long, this historic trail passes through playgrounds, woods, and neighborhoods. The paved path is great for walking and biking and it brings you from one town to another. The Wall bike bath can also be accessed from here.